It's always a delight to come across a fresh new piece of street art work for the first time, especially when it's been found in the most unlikely of places. 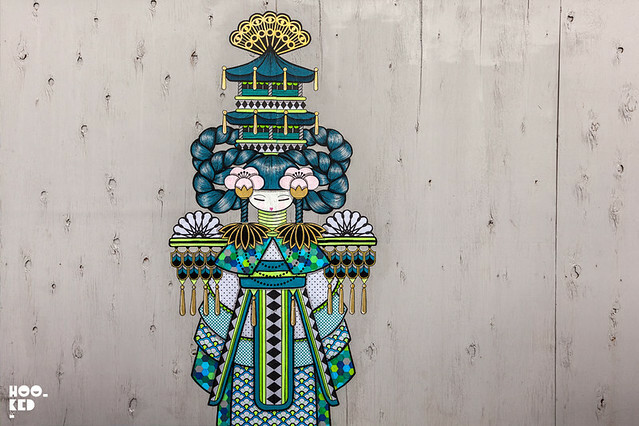 Yesterday Hookedblog discovered this beautifully hand painted pasteup by Brooklyn based French artist Koralie. 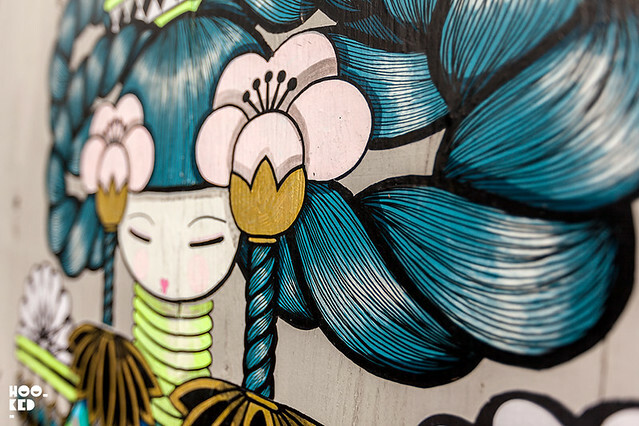 We have long been admirers of the work of Koralie and that of her husband, fellow street artist and tattooist Supakitch, who we visited in his Brooklyn studio in 2011. Graduating with an MA in Art from University Paul Valery and in Architecture from Ecole d’Architecture de Montpellier, it was during her early days while living in Toulouse that Koralie was introduced to graffiti and street art meeting the Truskool crew ( Tilt, Der, Ceet) along with female artists Fafi, Lus and Kat. 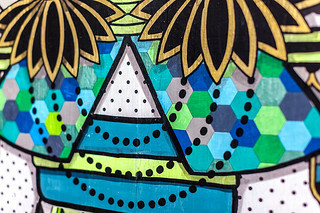 Collectively they encouraged Koralie to take her work from canvas to the streets and paint her first street mural, which on her return to her hometown of Montpellier became a regular part of her working process. 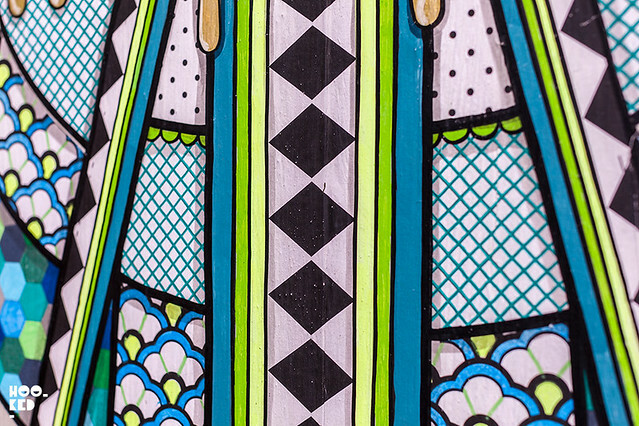 What has now become recognised as her signature style, a flamboyant geisha as pictured here, featuring a mix of graphic and cultural codes from various countries, customs and folk art, both ancient and contemporary. These large scale works can now be seen on the streets of many major European, American, and Japanese cities. Koralie says she “loves costumes, headgear, jewels, traditional objects such as African braids, kimonos, African ‘boubou’, Indian bridal sarees, English curls, Indian American objects, lacework, everything about Marie Antoinette, Japanese ‘obi’ belts, clips, Japanese etchings, chandeliers”, she likes to work on materials from various origins and mix them according to different cultures: Russian dolls, African braids, Indian jewels… and Japanese inspiration". 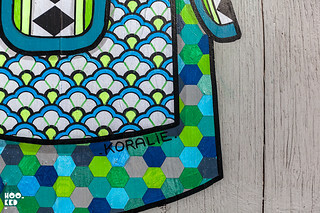 Koralie has just painted a series of windows, which are currently on show at the Ministry of Culture and Communication in Paris for a show called Oxymores that also features the work of L’Atlas, Combo, Eltono, Jean Faucheur, Honet, Lek et Sowat, Marko 93, O’Clock, OX, Surfil, Thom Thom, Jacques Villeglé et Gérard Zlotykamien. 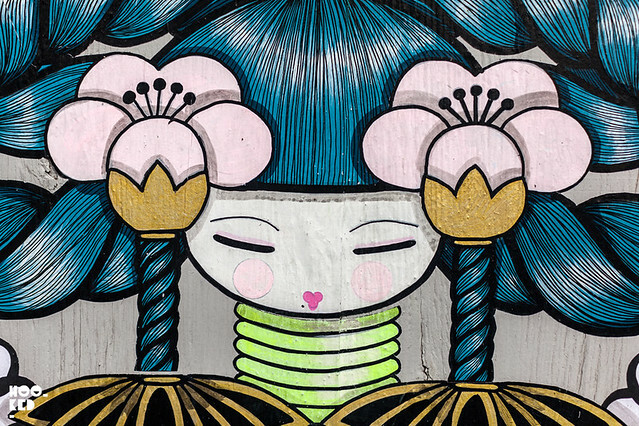 It would appear Koralie is currently in London and we hope to discover more work in the coming days from this artist during her visit to the city, let us know if you spot anymore? We agree. You should also have a look at this great short film also featuring Koralie. there are 50 new 3D Faces in total around London from this visit. still quite a few for us to discover yet! Could you please tell me the location? I am visiting from the US and cannot find the coordinates anywhere.